'Narrow Profile' Enclosure Boxes: The sides and bottom are an attractive extruded aluminum channel that withstands even severe abuse. The aluminum top, perforated for ventilation, slides into slots in the sides without need for mounting hardware. (There are also slots above the inside bottom of the case for holding an Accessory (see below) circuit board.) Moderate-dissipation components may be directly mounted to the case for heat sinking. Connectors, switches, controls and indicators are easily installed on the front and back panels. The boxes are finished in flat gold enamel. 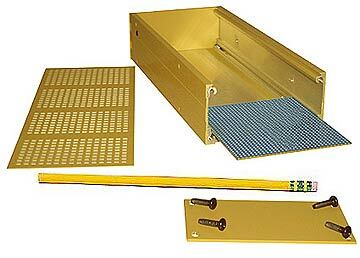 'Gold Box' Enclosure Boxes: Durable and economical, these are easily punched or drilled, allowing for easy mounting of connectors, switches, controls, and indicators on the sides and on the front and rear covers. Assembled with (8) removable 8-32 x 1/2" screws. MOUNTING AND ACCESSORY MOUNTING KITS: Threaded mounting holes are provided to permit mounting the boxes to an equipment frame or bracket. Accessory Mounting Kits are available for wall mounting or DIN Rail mounting. Circuit Board (for 'EN' models): Perforated board for mounting hand-wired components. Heat sink: High-dissipation semiconductors may be mounted on the accessory heat sink.